Friday Greetings my friends, from smokin’ hot Alberta. We’ve been in the in high 20’s - mid 30’s C (80’s and 90’s F) this week, and I am melting. Good thing it usually cools off at night now, so sleep is a little easier than earlier in the summer. School kicked off here this week and we only have one in grade school now. Our daughter is in her last year of University, our middle son is working this year and our youngest is in grade 9. We’re so grateful for good starts to the fall for them. Today I’m stopping back in with another Power Poppy creation for our Cozy Krafty Power and Spark Challenge. Colouring on Kraft cardstock with Copics is always fun, but I especially love to colour on Kraft with pencils, so this one is all about the pop of pencils. 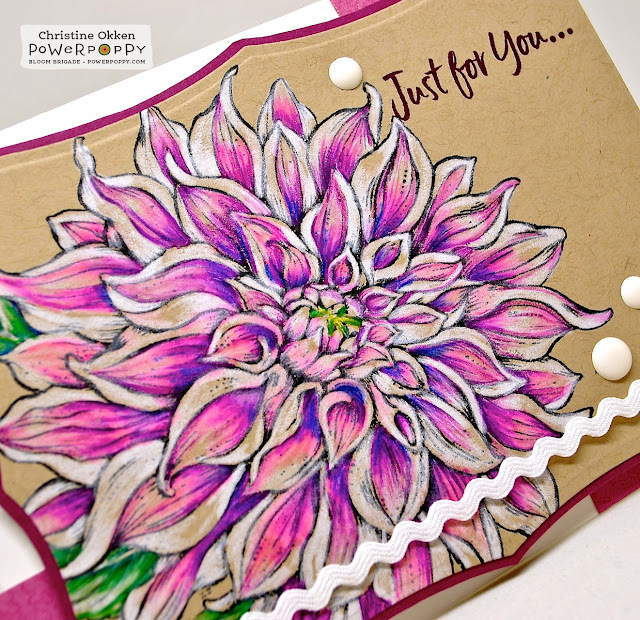 It's a last hurrah to summer using our gorgeous Dahlia XL stamp set. With its larger size I knew I could get into those petals with the pencils and give it some really fun vibrant colour. 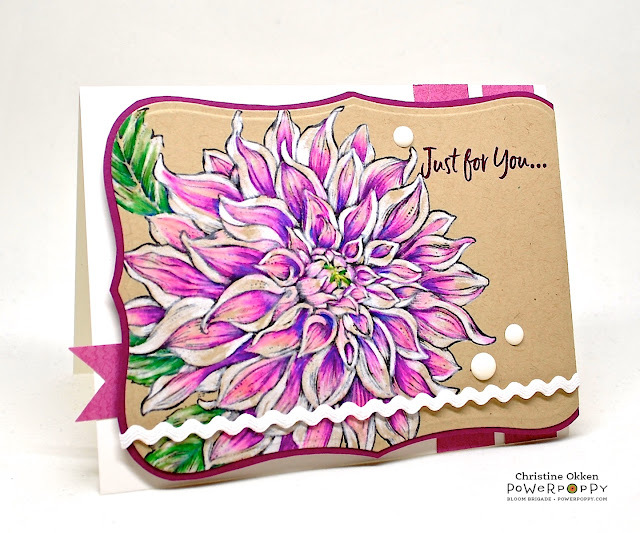 I started with a layer of white prismacolor pencil and then came back with some lovely magenta and purple pencils to give the centers definition. With such gorgeous petals I kept the details really simple, a few background strips of paper for a sense of movement, some enamel dots and then a bit of ric rack to ground the image. 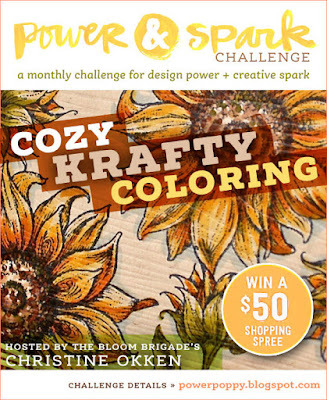 I have seen some really great entries so far in our Cozy Kraft Colouring Challenge, and I hope lots more of you join in. You could win a $50 Shopping Spree to the Power Poppy store....and if you heard Marcy spill the beans this week - we have a new polymer release coming this month so there will be even more awesome stuff for you to choose from. For more inspiration pop on by the rest of the Bloom Brigade playing along today! and Julie at the Power Poppy Blog with another Good Vibe Friday! Beautiful card, I just bought my first digital stamp from Power Poppy, love it! Ooooo... lovin' that beautiful lush pink with the delicate whites. Stunning colouring Christine! It just jumps off your card with enthusiasm! Stay cool my friend! So beautiful, Christine! You excel with any coloring medium. I've never yet colored on kraft. Sometimes I'm a real slow starter! Gorgeous! Christine this is wonderful, the white edges are awesome. Oh such vibrant color. Just gorgeous. Love the pop of magenta you added to those petals and the rick rack trim was the perfect touch. Thank you for the kind comment you left on my blog.